Medieval armor, characterized by steel patches with a plain surface, surmounted by a man-at-arms helmet typical of the first half of the XVIth century, provided with a mobile visor that leaves a narrow eyeslit for the sight. From the upper edge of the slit protrudes a fixed protection. Armor consists of a helmet with high crest tile horse healthy and visor with eye slit and stretched to cover mobile and protruding eyes. Ventilation fan with rosette. Ruff collar, chest to foot in envelopes, with no remainder, ribbed in the middle a little hollow neck, underarm turns striking the center and fell in double-oblique sections. Two ribs to fall below the neckline in counterbend open cusp; back with little batticulo modeled. Tassets shaped and finished, symmetrical and is attributed to the front flap to protect the upper thighs with fork to bell. Bracelets integers with harness and reed guardascella symmetrical, rounded front and rear wings slightly larger. Cubitiera guardacubito and in defense of the elbow. Knobs to separate fingers protected by scales and dummy from the wrist up. Thigh structured in a gun equipped with two hinged plates and buckled to protect the thigh. Ginocchietti articulated blades and fin. Armors like this was made by the milanese master armorers around the half of the 1500, commissioned by nobles and captains throught Europe. Height 6'8". Weight 70 pds. 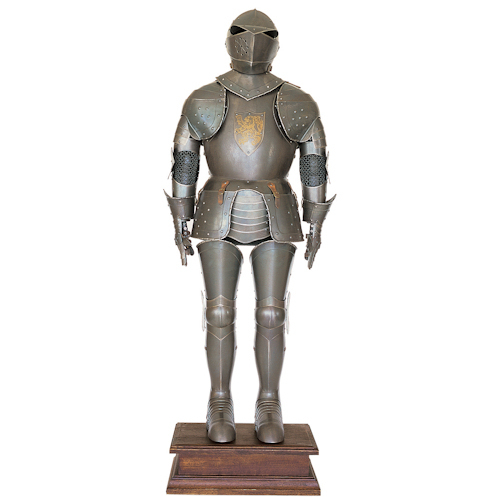 Handcrafted in steel with a rust finish that give it an old aspect and fully wearable, is provided with a wooden base and a steel sword.